If it’s not possible to ride a railway line – because someone removed the track – the best way to understand it is to walk it. 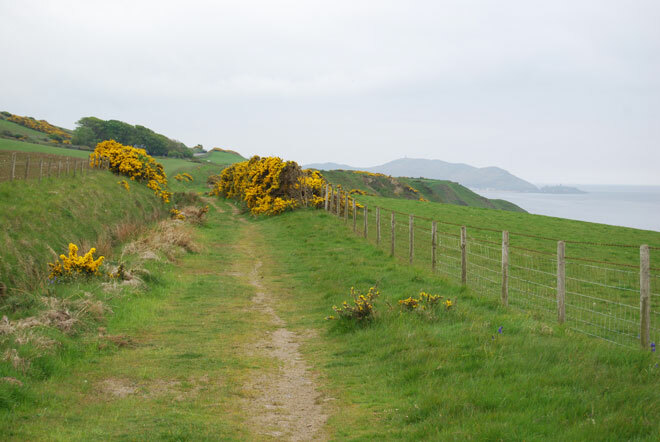 When the Manx railway-system was reduced to a single route in the 1970s, the Manx Government had the prescience to preserve much of the disused trackbed as footpaths. My Isle of Man host-with-the-most John and I walked the stretch of the former Manx Northern Railway from St Germain’s (where the station is now beautifully restored as a house) to Kirk Michael (where the railway station is now the fire station). The Manx Northern was built to take mineral traffic from the Foxdale mines directly to Ramsey harbour, using the only route possible for steam locomotives round the west side of the island. When the Foxdale mines eventually failed, the MNR became part of the Isle of Man Railway. Meanwhile, passengers between Douglas and Ramsey had gained a more direct route when the Manx Electric Railway was built along the precipitous east coast of the island. The Manx Northern route is spectacular. Walking up to the summit at Ballaquine and down to Kirk Michael is not strenuous, but the gradients are palpable. The ivy-covered piers of the major viaducts, Glen Wyllin and Glen Mooar, remain without the lattice deck that carried trains: you feel the height involved while crossing from one abutment to the other by steep paths and flights of steps. Travellers who are disinclined to walk the line can follow much of its course, and appreciate its spectacular views of the island’s west coast, on the Peel-Ramsey double-deck bus [routes 5 and 6], which is what John and I did – travelling in eight minutes the distance we’d walked in 2½ hours – when the pub in Kirk Michael proved unable to provide any kind of lunch. Instead we went to the excellent Creek Inn in Peel [http://thecreekinn.co.uk/], where we were served by a star barman called Chris, and ate smoked salmon wrapped in asparagus and spicy chicken wraps with excellent beer and friendly service. This entry was posted in Manx Heritage, Transports of Delight on December 25, 2013 by Mike Higginbottom.